It’s my last post, so let’s show the game box for Wolfie’s LEAST FAVORITE of my favorite games. I joined the iSlaytheDragon team three years ago and have been writing for the blog at least weekly (sometimes daily) ever since. I use the word “team” loosely, since at the time, iSlaytheDragon was Wolfie’s somewhat meandering RPG/board-games/cool-things-I-like blog. 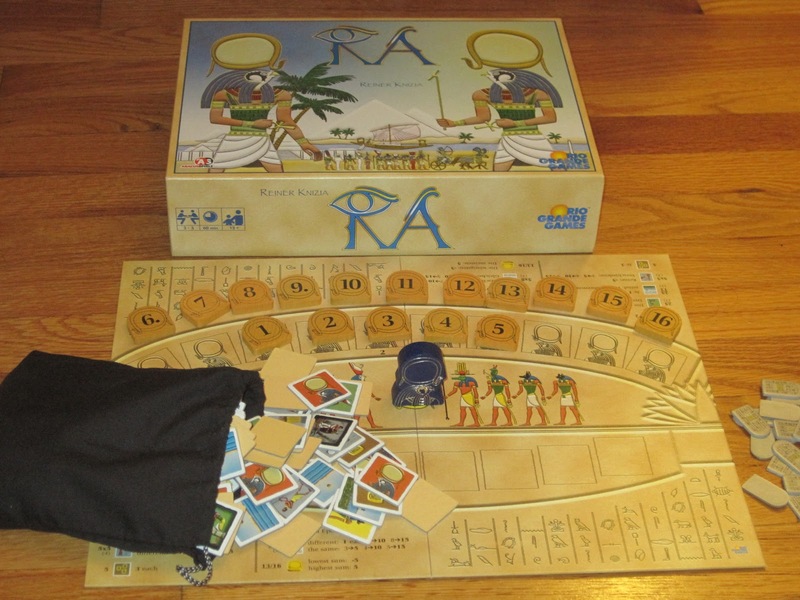 After we codesigned our entry in the Ticket to Ride map pack contest (which we didn’t win, by the way), we thought it would be fun to join forces to write about board games since my personal blog had become mostly about board games, anyway. This blog has been a labor of love for me ever since, but now it’s time for that labor to end. And good-byes are never easy. Chief among the reasons for me to stop is priorities. I received a promotion this year at work, and while the promotion mostly acknowledged work I was already doing, I have had to devote more time to my on-the-clock job. This year also saw the birth of my daughter, and now with two kids who need to be fed, held, tickled, tossed about like sacks of potatoes, and reprimanded, I’m beginning to recognize the need to be choosy with how I spend my time, especially as money is tighter and board game writing don’t pay the billz. As much as I love board games, writing about them is no longer a passion I want to indulge. And there are reasons for this as well. Writing is something I’ve always taken seriously. Even puff pieces for this blog or tweets or throwaway opinions–they matter, and their craft matters a great deal to me. (I’m an editor, after all.) As I read in my weekly blog perusal the possibly millionth review description of a game as “solid” and reflected on why the stock phrase was irksome, I realized that 1) much of the writing on the Internet about board games is bad, and 2) I don’t really have too much more to say about the subject. Yes, I tend to like games that place mechanical concerns before theme. I tend to favor simple games with depth over complex games with chrome. I like to sleeve my cards, I think Carl Chudyk and Reiner Knizia are master designers, and I have a great appreciation for games with simple components (that usually aren’t categorized as microgames). But you know all this if you’ve read this site with any regularity. What more is there to say, really? And is it worth it for me to find a new way to say it? Kurt Vonnegut was hired at Sports Illustrated many years ago, and his first assignment was to write about a horse that jumped the fence at the racetrack. Vonnegut wasn’t a sports fan, and he reached the end of his enthusiasm quickly. For his first and last assignment he wrote a single sentence: “The horse jumped over the —- fence.” With that, he was gone. I, obviously, have much more enthusiasm for board games than Vonnegut had for sports, and I plan to keep playing them, but I feel similarly at the end of my enthusiasm for writing about them. I’m looking forward to playing games without considering in advance how I would frame my opinion. Similarly, I look forward to playing games based on my interests rather than on what’s timely or what I’ve committed to write about. I look forward to my hobby becoming more like a hobby again and less like work. And perhaps when that happens I’ll feel more like writing about them again. In any case, Wolfie, Jason, Andrew, Jennifer, and Meghan are great at writing about board games, they are not sick of doing so, and I know they have some excellent stuff planned for the future. For my part, while today marks my last post in rotation for the blog, I still have a few review commitments to fulfill, so you may see a review here or there in the future, and I will continue writing the weekly news post each Monday through Gen Con. And, hey, I’m not dead. You can still find me on Twitter and Board Game Geek. And, let’s be honest, in the forums at this site, because [biased statement ahead]iSlaytheDragon is still the best board game blog on the Internet. Thank you, readers, for making it so. I certainly understand. Sorry to hear you’re stepping back. I enjoyed your writing. I’ll stay tuned. I took a similar semi-sabbatical from gaming when my kids were younger. Glad to report that the hobby is evergreen. Sorry to see you go, Lenny. We had similar tastes in games, and I enjoyed your reviews. At the same time I COMPLETELY understand your motivations. As a parent and semi-retired blogger, I can identify completely. Thanks for all the great writing you’ve provided over the years, and don’t worry, your kids will bring you endless hours of fun and frustration, too. My oldest is now 10 and she loves many games, including a variety of deckbuilders. As Corey notes, the hobby’s evergreen. I echo the sentiments above. I’ll miss your writing, but I appreciate that you recognized the need to take a step back. Congrats on the promotion! Ah, too bad. I just recently discovered your work. Thanks for the thoughtful reviews and good luck in all that you do.